Serva is an easy-to-use server package supporting a variety of protocols including HTTP, FTP, TFTP client/server, DHCP and proxyDHCP (PXE service), BINL, DNS, SNTP and SYSLOG. Focused on the quick deployment of a stable platform running as many server protocol engines as possible, the program doesn't aim compete on with other server tools in terms of speed or security. Serva also allows you to setup a server which you can use to install Windows over a network without Microsoft's RIS/WDS/WAIK suites. How to extract: Download the ZIP package and extract to a folder of your choice. Launch Serva32.exe (for 32-bit OS) or Serva64.exe (for 64-bit OS). I wish I could convince Adobe to offer a "nagware" version of (let say) "Photoshop"
What it's done here it's a bit childish; if the application is not good erase the thing, if it is good just accept it as it is, but do not distribute buggy ancient versions. b1001: Please move discussions on policy to forums. Responses to Joby's message are there as well. 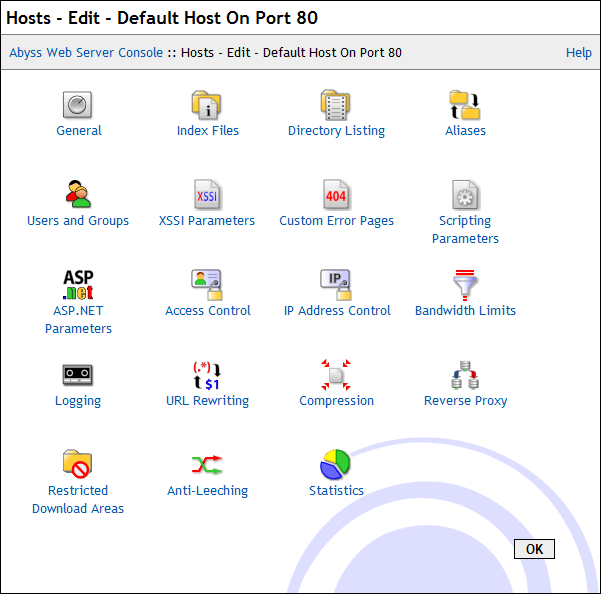 Abyss Web Server is a lightweight web server that supports secure connections, compression and a variety of web technologies. Includes dynamic content generation through CGI/FastCGI scripts, ISAPI extensions, native ASP.NET, reverse proxying, eXtended Side Includes (XSSI), custom error pages and log rotation. Includes remote management tools. Security features include SSL/TLS, anti-leeching, password protection, bandwidth throttling, IP address controls, anti-hacking features etc. Clients available for Mac OS X and Linux. Optionally, to install additional components (PHP, Perl, Python etc.) follow the instructions on Aprelium's website. Then move the PHP folder inside Abyss' folder and change the PHP path in abyss.conf to a relative one i.e. ".\PHP\php-cgi.exe". Works great I have been using it for 2 years with no significant errors or bugs. Works well with ASP, PHP, MYSQL. Hi, anyone here know why I cannot connect to 127.0.0.1:9999 (Abyss configuration page) when using Privoxy, is there a workaround ? If I use No Proxy then ok but not when Privoxy enabled. I tried other web server app like Xampp or Tiny Webserver then ok, only Abyss have this problem ? Cattleya: have you tried changing the admin port (away from 9999)? Privoxy might be redirecting it for some reason. 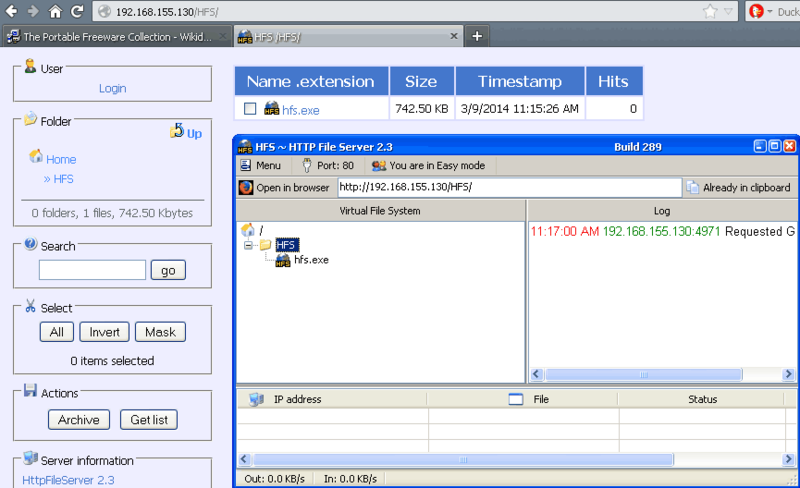 HFS (HTTP File Server) is a great tool for sharing files on any device with a web browser. Just setup the program, add files and folders via drag and drop, and connect to the web address. The web view is an easy-to-navigate page that provides search, a variety of view options, and even the capability to download files and folders in a single archive (TAR format). Other features include user controls, uploading, speed limits, transfer logs, "expert" view, and IP bans. Note that to make the program available over the internet, a dynamic DNS-type service may be necessary. Functional in Linux under WINE. FYI, in the stunnel forum topic there's some additional tools for easy configuring HFS (http://www.portablefreeware.com/forums/viewtopic.php?t=21551). The Uniform Server is a complete web development system containing Apache, PHP, MySQL, Perl, phpMyAdmin and more. Additional plugins on the website will extend the system with FTP server and Java servlet support. Note: One useful function of this program is the Wiki on a stick tool that works with Uniform Server. I've been using Uniform Server for a few years now and I really like it. With windows 7 there does seem to be an issue with stopping and starting the services for some reason. You can get around it by uninstalling the services through the right-click option on the tray menu icon but it won't work through the apanel web interface. Even with that problem I am still too hooked on Uniform Server to even try anything else. It seems v8.0 is out. Due to the big version jump I did not want to update the entry without testing. Is this project still active? There hasn`t been any updates for awhile. Nothing for the last 2 PHP7 branches. Last update was January.